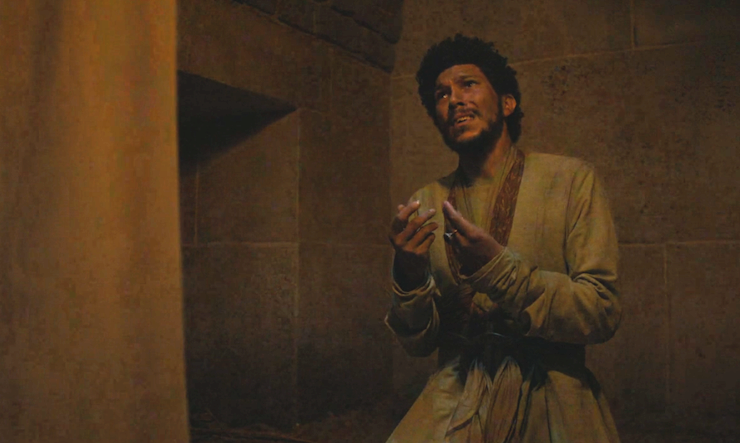 SPOILERS: Don’t read this review if you have not yet seen or don’t want to know details from Season 5, Episode 5 of Game of Thrones. Stannis is surprised when he realizes that Sam is the son of a great warrior, Randall Tarly, the man who defeated his brother Robert once in a battle. Sam (humbly) tells Stannis that he has killed a Whitewalker, like the crows said. Now, he’s going through all the books in Castle Black to find ANY reference of the creatures. In a world where all men must serve, some serve better by using their brains NOT brawn (or Bronn- pun intended). Sidenote: Wasn’t it funny when Stannis corrected the grammar of one of the Night’s Watch? Here is the scene, along w/ one from Season 2, Episode 4. Aww, I LOVE the little light-hearted moments in this (mostly serious) show! I liked how Shireen had time to make friends w/ Sam (a bright bulb like herself) and Gilly (who she was teaching to read). If YOU saw a dragon, you’d probably need a drink, too! Jorah is surprised to see how big Drogon has gotten; Tyrion is speechless (for a change). Sansa is at Winterfell, BUT it’s not like home at all. Ramsay’s freaky/VERY jealous girlfriend, Myranda, shows her to the kennels where Reek (formerly known as Theon Greyjoy) is sleeping. 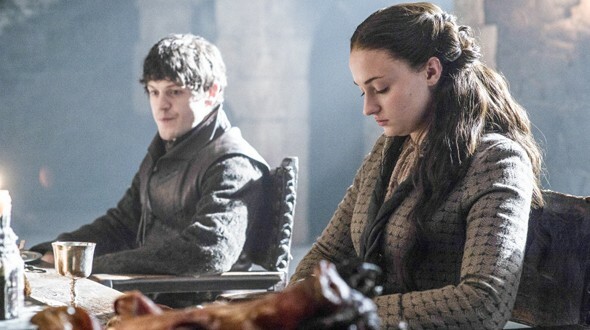 Of course, Sansa is shocked to see the state of her adopted brother-turned enemy. Wow, was that dinner awkward?! Ramsay says that Reek will give away Sansa (being the closest to family). Roose announces that Walda is expecting their child, possibly a boy. Oh yeah, that shuts Ramsay up fast! Did you notice the look on Sansa’s face? It was golden! 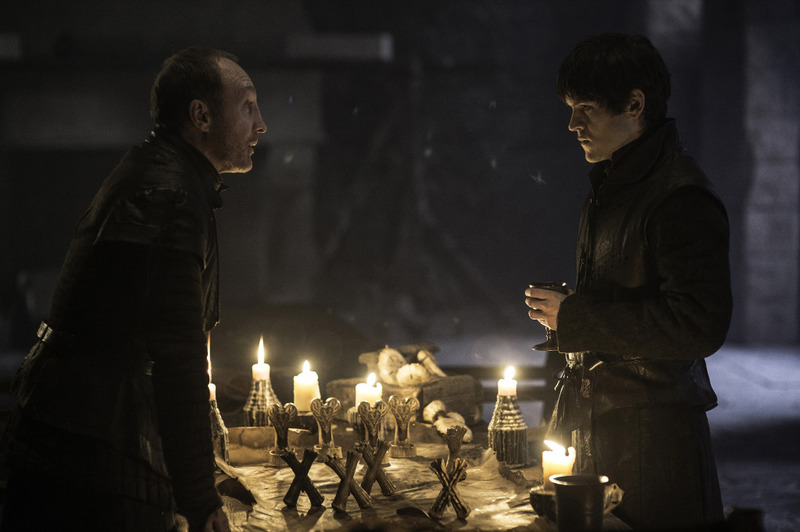 We (finally) learn Ramsay’s origin story- it’s a HORRID one, of course! Hmmm, I wonder- does Roose love Ramsay? Or is he just using the sick, sinister young man to further his ambitions. Ramsay (as MANY critics/viewers have written) is worse than his father. Jon worried what the other crows will think if he makes a certain decision. Maester Aemon (How cool is he!?) says that Jon’s the one that must make the decision, and it doesn’t matter what he or anyone else thinks! It’s time for Jon to put aside his doubts and lead, as a Lord Commander should. The BEST parts of this ep involved Jorah and Tyrion, two noble men from Westeros traveling through a (rather spooky) area of Valyria. They admire the ruins, recite a poem together, before being attacked by the Stone Men. Whoa, those dudes were kinda scary! Jorah fights with several of the zombie-like men. 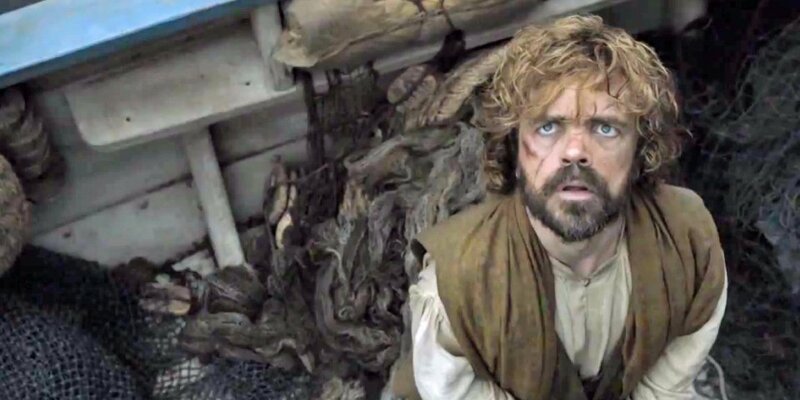 In the commotion, Tyrion falls out of the boat. As he struggles w/ the rope binding his wrists, he sinks lower, then the screen goes black for a few VERY tense moments. No worries, Tyrion is safe! He and Jorah (one of my faves) are on an empty beach, but the knight has contracted Greyscale- OH NO!! !